Nice airy room with a modern finish for Bolivia. The location is great and our room was quiet (Road can't be helped). Nice hot water and spacious room and bathroom. Breakfast was generous for a Bolivian breakfast. Excellent breakfast!! Staff were very helpful and nice. A real hotel, properly managed! Rooms are spacious and really nice. Great breakfast. Clean. The location is decent (Copacabana is quite tiny overall), and some of the rooms have a nice view towards the lake. Loved the view and the spaciousness of the room. Great breakfast. Awesome hotel! Great value! Super clean! The room was spotless and beds were comfortable. The shower was clean and had hot shower. Ask for a room with a view! You can also watch the sunset from the terrace at the top! The staff is super nice and helpful. They can keep your bag if you go to Isla del Sol. They also helped me out to make a call at midnight (even though reception was supposed to be closed). Breakfast was very generous and varied, one of the best we had in South America! The wifi worked very well. Highly recommended . 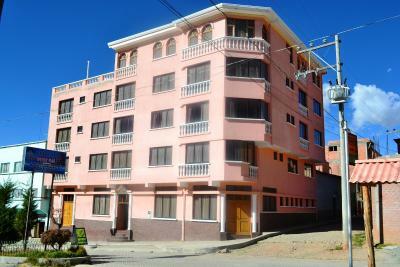 The bus stop (to la Paz or Puno...) is only few meters away so it's very convenient. Excellent location near the center, my room was facing the lake. The breakfast was great as well. Nice stay. Best breakfast in 40 days of traveling in South America! Comfortable bed, hot shower, super friendly staff all for a budget friendly price. Hotel Wendy Mar This rating is a reflection of how the property compares to the industry standard when it comes to price, facilities and services available. It's based on a self-evaluation by the property. Use this rating to help choose your stay! Only 650 feet from Sucre Square, Hotel Wendy Mar offers rooms with free Wi-Fi and cable TV in Copacabana. Breakfast is provided. Titicaca Lake is 1,300 feet away. Bright and spacious, rooms at Wendy Mar are fitted with stylish wooden furnishing. All of them have private bathrooms, and some of them afford lake views. There is a computer with free Internet access at the lobby. Guests can unwind on the terrace or visit Nuestra Señora de Copacabana Church, which is 1,650 feet away. Hotel Wendy Mar is 500 feet from the international bus stop. This property is also rated for the best value in Copacabana! Guests are getting more for their money when compared to other properties in this city. When would you like to stay at Hotel Wendy Mar? Features cable TV and private bathroom. House Rules Hotel Wendy Mar takes special requests – add in the next step! Wifi was a little hit and miss. Great property, a bit old but all is needed is there. Owner was super helpful! Wonderful staff, they are so helpful. Organised laundry, held my bag when I went to Isla del Sol for one night and after I checked out as my bus to La Paz was early evening. Shower was hot. Breakfast was really great- a lot of choice if you manage to get down there early. Staff were so friendly and helpful, loved the dog they had too. Room was clean, bright, lovely view and only a few minutes walk to the beach area, bus stop or town. Great place to stay in Copacabana. Overall accommodation in general is a bit overpriced in my opinion but this place was a good value. Excellent breakfast, very comfortable bed, spacious room, great hot shower, decent wifi and location was fantastic. Would stay again. Hot water in the shower is sporadic. Good breakfast and really nice view! Horrible shower, no pressure at all. Staff weren't very friendly or helpful. Delicious breakfast, great variety. Lovely view from the room. The person who checked me in and out was completely non-communicative. In fact, spent the whole of the time I was checking in on his phone. No welcome / interaction / customer service at all. I had requested a lake view room, which had been confirmed was ok to have. I was given a room on the first floor from which I could just about see the lake but the view was blocked by a Youth hostel and a school. Given how few people were staying in the hostel, why was it not possible to be in a room on a higher floor? The room had a glass bedside lamp - good to have a bedside lamp - but some of the glass panes were broken and some were completely missing. I pointed out the danger of this - and it was changed the next day - but why did it take me to point this out? The towel rail in the bathroom had broken off, so not only was there nowhere to hang the towel, there was a big hole in the wall, which no-one thought was important to repair? There was a decent size bathroom but the shower cubicle was tiny - difficult to shower and the shower door was loose and hanging off the hinges, so made showering difficult. Again, no-one thought it important to fix. When I pointed out these things, there was a lack of knowledge that they existed - how can no-one notice?, there was a shrug of the shoulders but no apology! It felt like as a solo traveller I was given the worst room in the hostel. The room was big and had a large window. The breakfast - there was a selection of brown (as well as white) bread and rolls, plus banana bread, muffins and cheese rolls in addition to the usual eggs etc. Our room was at the third floor and we need to climb 3 levels with luggage.